The Israeli newspaper Haaretz reported today that a project is underway to remove centuries of accumulated debris from the Old City’s ancient Hezekiah’s Pool, a site few visitors to Jerusalem (and even many residents, I suspect) are even aware of, since it is completely surrounded by the shops and houses of the Christian Quarter. Located in so many people’s backyard, as it were, and it’s ownership in dispute among various parties, it has filled up many meters deep — how many we shall see! — not only with piles of rubbish but with the wind- and water-deposited earthen layers of the centuries. Now the municipality of Jerusalem has decided it’s a health hazard, which it certainly is, and taken the initiative, despite many protests, to not only clean it up but also install proper drainage. And, Jerusalem being Jerusalem, the project spins off disputes involving religious communities and supposed international stakeholders. Nobody, not the Copts or the Waqf, is happy about Jerusalem’s attempt to conquer an incessant health hazard. After years of neglect, Hezekiah’s Pool in the Old City of Jerusalem is finally being cleaned up. The work is being done by the Jerusalem Municipality, the Environmental Protection Ministry and Jerusalem Development Authority. As with anything in Jerusalem, the cleanup may cause a diplomatic crisis with Egypt and Jordan – and a conflict with the Waqf Muslim religious trust and the Coptic Church. Hezekiah’s Pool, also known as the Pool of the Pillar, is located in the Christian Quarter, not far from Jaffa Gate. It is ancient and covers over three dunams (three-quarters of an acre ). But it is completely hidden from the public, with stores and homes surrounding it. Thousands of tourists coming through the gate and the Arab market pass right by it without having a clue that the historic site is nearby. The pool was used at least from Second Temple times and was an important part of Jerusalem’s ancient water system until the 19th century. However, over recent decades, the pool became an unofficial garbage dump for neighborhood residents, who used it to dispose of tons of trash. 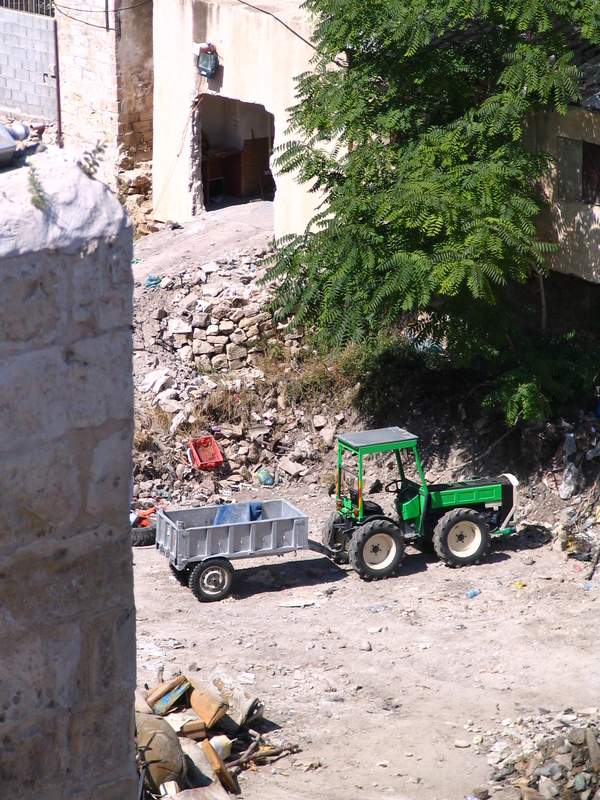 In winter, water still collects there, and some Christian Quarter residents use parts of the ancient water system as an improvised sewage system. Hezekiah’s Pool has turned into a serious health hazard in a densely populated area. At least three different bodies claim ownership of the pool: the Islamic Waqf, the Coptic Church and the Greek Orthodox Church. The municipality has been holding talks with the three claimants for a few months in a bid to force them to clean up the pool. The Waqf finally agreed to the cleanup, said sources involved in the matter. But after the religious trust did not do anything to clean up, city hall decided to do the work itself. Aside from the cleanup, the city is planning drainage and plumbing work to prevent a repeat buildup of water and sewage in the pool. The cost will be about NIS 3 million. The Waqf says it had intended on doing the cleanup job, but was stopped by the police for fear of possible conflicts with the Copts. The city reached an agreement with a store owner whose shop borders the pool on Christian Quarter Road and tore down the store’s rear wall to allow small tractors to enter the pool. Workers began to pile up the garbage in huge mounds. The city wants to send the bill to the Greek Orthodox and Coptic churches and the Waqf – and they are furious. The Egyptians are involved as patron of the Copts, and the Jordanians see themselves as the protector of the Waqf. The two governments are expected officially to ask Israel to stop the work. What’s interesting in Jerusalem is that religious communities often vie for the privilege of cleaning, fixing and maintaining something — and especially footing the bill — since this implies ownership and control. This has long been part of the dynamic of the nearby Church of the Holy Sepulchre. In the case of the pool, however, the usual jockeying for position seems to have ended in deadlock. I have never heard the place called the “Pool of the Pillar” as in the article — I wonder if it represents a poor translation from an original Hebrew version of the article. It is presumably the pool referred to by Josephus as “Amygdalon” (War 5: 468) in connection with the breaching of Jerusalem’s walls in 70 AD. The Greek word amygdalon itself means ‘almond tree’, but the place-name is thought to have actually stemmed from Hebrew migdal, ‘tower’, the connection being to the nearby monumental towers Herod built at the western entrance to the city (War 5: 161ff). In the Medieval period it was still in use and known as the Pool of the Patriarch’s Bath. What’s interesting is that the pool has never really been examined archaeologically, and I can’t help but wonder whether some probes, soundings and explorations might be carried out in the course of this project. Just within the last year or two the aqueduct channels, both Byzantine and Roman/Herodian versions, which fed the pool were exposed and documented in infrastructure work inside Jaffa Gate; the channels were coming from the Mamillah Pool in the upper reaches of the Hinnom Valley, which was already understood. As for the dating, I have always suspected that the “Hezekiah” attribution could actually be correct, or not far off. Such traditional names must often be taken with a (large) grain of salt, of course, especially anything dubbed “Solomon’s” (Pools/ Quarries/ Stables — take your pick). My only evidence for it actually being “Hezekiah’s” Pool derives from common sense and human nature, and I advance it in the form of a question: Once Jerusalem’s western hill became populated, and especially after King Hezekiah enclosed it within a wall, all in the general time-frame of 700 BC — an understanding experts have had for only the past several decades or so! — where did the people living “up there” get their water? They certainly wouldn’t have carried it up from the Siloam Pool or from a “Sultan’s Pool” catchment way down in the Hinnom Valley. How do I know? Because they were lazy, just like me! — and they would have found a clever way to bring the available water to where they lived! Finally, here are some photos taken this afternoon (16 JUN 2011) which connect with the current state of the Pool and the clean-up project, which got underway about a week ago. By the way, the workers’ access to the pool is through a shop space located at 76 Christian Quarter Road. (A scholar has now identified this address as the long-lost shop of the 19th century antiquities dealer and probable forger Moses Shapira!–see HERE.) The photos are the best I could manage seeing as the roof of the Petra Hostel, my favorite vantage point for the Pool, is temporarily closed. The article does not state how much material is to be stripped away — I can’t imagine the goal is to completely clear it, down to the floor (although that would be hugely interesting) — so we’ll have to wait and see. Overview of the Pool, looking NE. 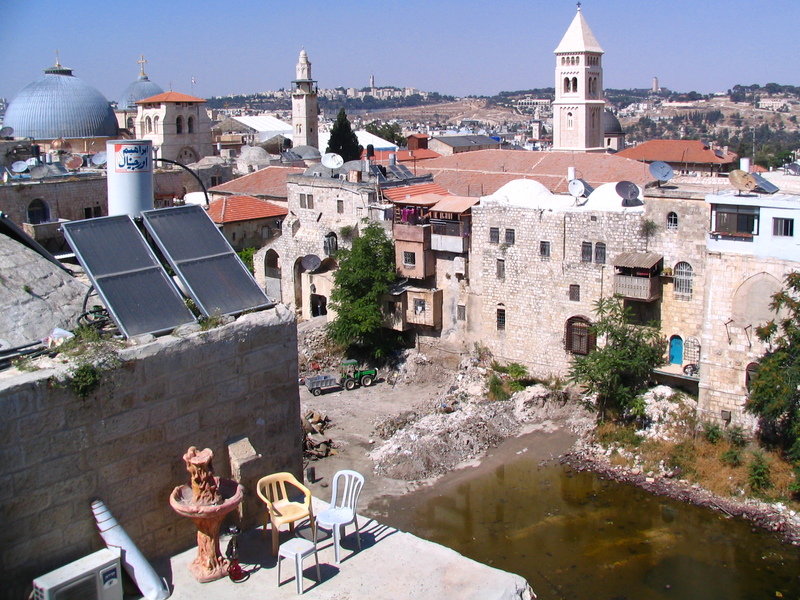 The buildings visible on the skyline, L to R: the domes and bell-tower of the Church of the Holy Sepulchre; the minaret of the Mosque of Omar; and the bell-tower of the Lutheran Church of the Redeemer. The green, stagnant water is left over from last winter’s rains. 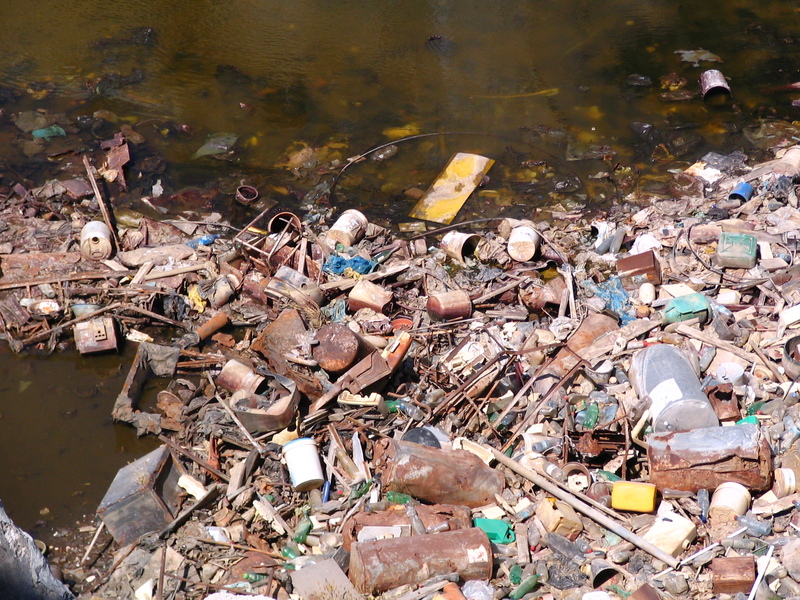 A sampling of the accumulated debris — the tip of the iceberg! See my UPDATE on this story! This entry was posted in Uncategorized and tagged aqueducts, Hezekiah's Pool, Jerusalem, Old City. Bookmark the permalink. Thanks for your post. Just this morning I was thinking that there have not been any really “juicy” discoveries or stories for a while (not just from you but from any of the blogs) — and then you post this VERY interesting one! The story is like the story of the Birkat Israil REDUX. That pool was also cleaned up — in 1934 — because it was a health hazard too. Unfortunately they filled that pool in and made a parking lot. Would it have been interesting to see what was at the bottom of that pool when it was completey empty — and where the channels were that led in nd out of it! That pool was the object of some extended study by me and expressd in PEQ 142, 3 (last Novemeber) — as I modestly point out. Do you know the dimensions of the Pool of Hezekiah? If you could borrow a little John Deere tractor from the Ecole Biblique, you could drive right in and get some even better pictures!! Joe, hi… Thanks for your comment! All 3 photos were taken from exactly the same location, a window on the second floor of the Petra Hostel, situated at the head of David Street inside Jaffa Gate. The Petra’s roof two flights up is the preferred vantage point, but I found it closed (for repairs? ); I was told it would not re-open for a couple of months or so. Tom, for somebody like me who’s never been there, can you please describe the relationship between the exit of the tunnel that is commonly photographed (where I’ve heard it said that people do their laundry) & this overall mess shown in your first photo. When tourists exit the tunnel, do they wade through the muck? Or is that a whole different place? Thanks, Tom! I had never heard of this place prior to this news item. The Siloam Channel, Siloam Tunnel, Hezekiah’s Tunnel, Hezekiah’s Wall, Hezekiah’s Pool, Siloam Pool (Byzantine), Siloam Pool (Biblical) … oy veh! Thank you Mr. Powers for this nice piece of work (again!). One day I hope to see these places by myself. And that will be (also) your fault. Elia: Thanks for your comments. I have been back recently and hope to post some new photos in a few days. They’re actually doing it!